West Coast punk legends Lagwagon and Swingin' Utters have been consistently inspiring bands since the late '80s/early '90s. So when Lagwagon planned to hit the road late last year in support of their new LP, Hang, it only made sense that Swingin' Utters (who were also gearing up to release their new album, Fistful of Hollow) hop on board and create a must-see tour for fans of all generations. 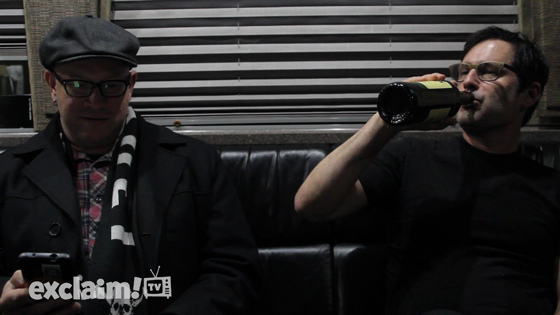 We recently met up with Joey Cape (Lagwagon) and Darius Koski (Swingin' Utters) inside their tour bus before a recent show at The Opera House in Toronto to film the latest instalment of Exclaim! TV's Chatroom. From the get-go the duo's longtime bond became apparent, as Cape and Koski — armed with a bottle of Jameson — smirked and struggled to keep a straight face while answering viewers questions (submitted to us through social media) during the Q&A. That being said, the fans did not disappoint, asking questions seemingly catered to the guys' quick wit. Queries about Cape's karaoke history and breakfasts with bandmates were topics of discussion, while others simply asked for advice, appointing the pair as reluctant connoisseurs of cool. Watch the Chatroom session now in the player below.